Your guide will pick you up at 8:30 AM and you will start by going towards Rustaq which is in the Western Hajar. Rustaq was once the capital of Oman, during the era of Imam Nasir bin Murshid al Ya’arubi. Rustaq Fort, built four centuries prior to the dawn of Islam in Oman, is an imposing structure built on three levels, containing separate houses, an armory, a mosque and four towers. The tallest tower stands over 18.5m high and has a diameter of 6m. The journey continues to Nakhal and its 17th Century Fort built on the peak of a mountain. Nakhal Fort is one of the most spectacular forts, dramatically located at the edge of the Jebel Akhdar Mountains in northwest Oman. It is surrounded by a beautiful oasis. There is an area with healing warm springs, the most notable being Ayn A’ Thowarah. Its waters run at 45°C and are regarded as a cure for rheumatism and skin diseases due to its sulfur content. Your guide, will then take you to Wadi Al Abyad, enter the wadi to see the famous “blue pools” and calcite. If you have enough time, you can do the easy walk all the way to the village Al Abyad or explore the pools in the immediate vicinity, the blue pools are roughly five minutes down the wadi. Lush scenery and if there is enough water, you can do some wadi bashing. 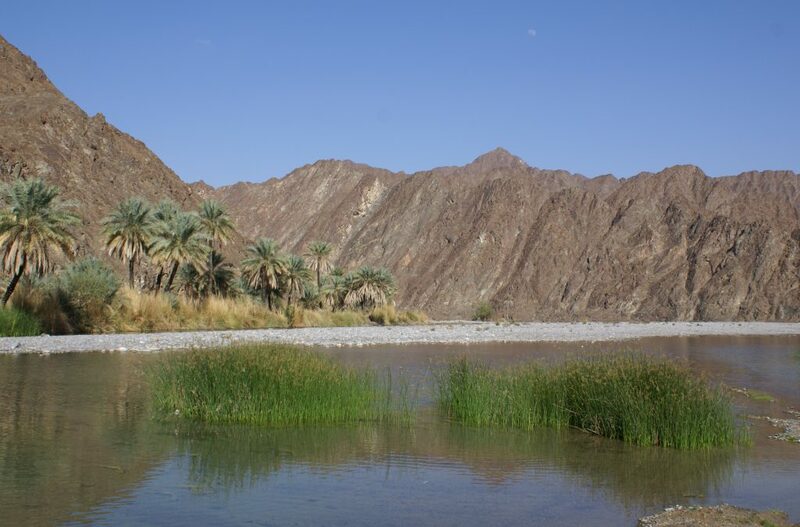 Water in the wadi will depend on weather conditions the previous days. Head back to Muscat.